Quick Fruit is an autoflowering variety characterized by her high yield and an especially sweet taste and scent. This hybrid between a Lowryder #2 and a Grapefruit variety can most definitely be called a success. Quick Fruit will become slightly larger than the average autoflowering cannabis variety. Especially when you place the Quick Fruit outside in a large pot or in the ground, she could grow up to be a plant of over one meter with a very large main cola and many side branches growing big buds. The Quick Fruit is an autoflowering cannabis variety with both indica and sativa influences. The plant looks like a beautiful indica/sativa hybrid with thick leaves and an open structure. The indica side of this variety has given this plant an even shorter growing and flowering period. The Quick Fruit is an extremely fast flowering plant and the first signs of flowering will be seen around day 17 or 18, after which she will finish flowering in 6 to 7 weeks. This makes her one of our fastest autoflowering varieties we have available. Like most autoflowering varieties the Quick Fruit is easy to grow and can handle slight abuse. For the outside grower there is another big advantage: this variety holds up in colder temperatures. Ideal for people who aren't blessed with a warm and sunny climate. 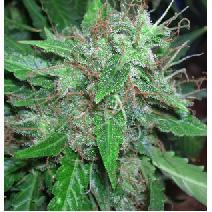 The taste of the Quick Fruit is, as mentioned before, very sweet and fruity, and she is soft on the lungs when inhaling. In order to get the taste as sweet as possible it is important you dry the buds after harvesting: for a period of at least 2 weeks. The effect of the Quick Fruit is well balanced with a relaxed high, yet intense with a light body buzz. Quick Fruit is 100% autoflowering and will complete her life cycle in 60 - 65 days. From seed to harvest!